No Equipment, No Problem. Perform this workout when you cannot get to the gym or firehouse. It can be very difficult to try to stay "fit for duty" on vacation, during the Holidays, or if you don't have access to a lot of equipment. You could always go for a walk, do some stretches and/or maybe run some stairs. All good options. You could also do this great bodyweight workout. I actually performed this workout a couple times on vacation in a small condo with only a towel and a little floor space. The objective of the workout is to complete all the assigned reps of each bodyweight exercise (total of 500 reps). **You can substitute out any of the exercises if you would like. Beginners can bounce around from exercise to exercise until all reps are completed. For a more challenging workout you should try to complete all the reps of one exercise before moving to the next. Perform a couple of minutes of the active warm-up movements first and then try to complete the 500 reps as swiftly as possible. Rest when you need it, especially if your form is starting to fail. Don't perform poor reps! Start with these active warm-up movements. Perform at least one circuit of the four exercises, perform 2 circuits if you are very tight or sore from travel or a rough shift. Click Here for a Video of this 4 exercise Active Warm-up routine. 50 Towel Rows- I used a towel and wrapped it around a door to perform these body weight rows. You can click here to see some great options to pull-ups and/ or body rows if you don't have a lot of equipment. Follow up the workout with a 10-minute stair interval. Run steps for 30 seconds as fast as you can, rest for 30 seconds then repeat for a total of 10 minutes. You can also run in a parking lot or garage. Anything that will get your heart rate racing. Give this workout a try. Use this if you are in a pinch and cannot make it to the gym. Make it a great day (or shift). Let me know how I can help you get more fit for duty. 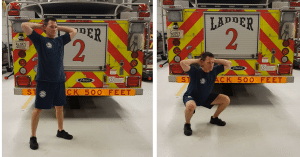 FYI- This is an example of the type of workouts you get in the Fire Rescue Fitness Fit for Duty Challenge Program. Includes workouts, eating guide, NEW FRF workout tracking app... everything you need to succeed. Check out what other Firefighters are saying about this great workout (click here to get FRF).